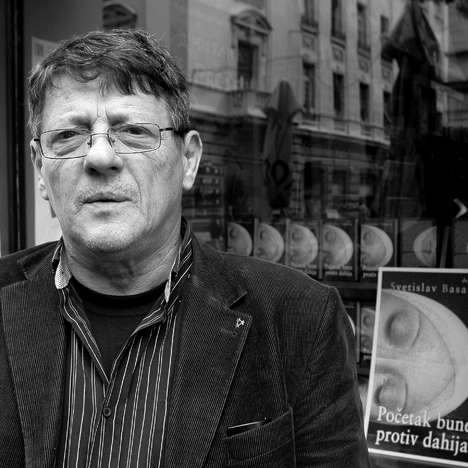 Svetislav Basara belongs to a tradition of modernist writers out of Serbia and the former Yugoslavia that includes Danilo Kiš, Dubravka Ugrešić, Oskar Davičo, and Ivo Andrić. The enfant terrible of contemporary Serbian literature and culture, Basara has won every major Serbian literary award, including the NIN Prize for his novel Uspon i pad Parkinsonove bolesti (The Rise and Fall of Parkinson’s Disease), yet he is little-known outside of Serbia and to date only two of his twenty-plus works have been translated into English—the novel Chinese Letter and, just published by Open Letter Books, The Cyclist Conspiracy. Basara does not consider himself a part of any national or international literary movement, but his literary influences are obvious—Kafka, Beckett, Borges, Ionesco, Queneau—and he routinely makes explicit reference to their work in his novels: it is not unusual for a Basara narrator to break from a scene—or what passes for a “scene” in his novels, which can be read as collections of pathological monologues—to pay sudden and undue homage to an oblique literary reference. Nearing a paranoiac fever pitch toward the end of Chinese Letter, the narrator Fritz breaks his own line of thought to proclaim, “This coffee is conspiring against me! I have a box of coffee on which it says FRANCK KAKA. Quite an ordinary box. But this is a perfidious anagram: FRANCK KAFA. It means—‘The Trial.’ Why quotes? It’s enough to say the trial. I hope it’s clear to me what I wanted to say.” Far from an anomalous passage, these lines exhibit not only the manic temperament and intense kinetic energy that is typical of Basara’s writing, but also the explicit referencing and stylistic mimicry that feed the mania. Such passages hold no narrative or structural purpose; their only purpose is to introduce to the surrounding text, apropos of nothing, textual moments of literary history so the two, like the meeting of creatures from different geologic eras that nonetheless share genealogic roots, may hold a brief and bizarre bit of dialog with one another. Basara’s prose writhes with literary history and his characters tend to have obsessive relationships with a certain literary heritage. As one might imagine, much is lost in Basara’s self-referential fictive worlds and it is not always clear to anyone what is trying to be said, but this is all quite fitting within the context Basara’s grappling with modern psychological anxieties and (mis)communication. In Chinese Letter, the narrator—a man who calls himself Fritz but is sometimes Salajdin Bejs or something else entirely—is given the task by two anonymous thugs to write “100 pages or so” of his “story,” a task that serves no purpose and, if not completed, holds no certain consequences. “Nobody told me what I should write about,” Fritz says, “but they gave me a deadline. They said: ‘We’ll be back soon.’” The account Fritz produces of his attempt to complete this statement is, of course, the novel itself, which runs a lean 100 or so pages. The utter senselessness of the imposition forces Fritz to confront the existential absurdity of what it means to be a witness to one’s own behavior and existence. Chinese Letter is an existential novel that directly and unapologetically traces over Kafka and Ionesco, a book not distinctly inventive in terms of its major conceit, but acutely attuned to its own genealogic history. Ostensibly an account of Fritz’s daily activities—his “story”—the novel quickly becomes an act of psychological self-assessment. Like a Thomas Bernhard novel, it’s not the reportage (the activities, observations, epiphanies, etc.) that matters so much as the digressions, leaps, and discursive prose: it’s through our observation of the telling of Fritz’s story that we come to a deeper understanding of the structure of his mind and a stronger appreciation of his emotional state. His observations about the world around him are quite unimportant (even when Fritz stresses their importance): they are merely information collected by his outward senses, while the truest expression of his self is revealed only in the direction, often circuitous, of his maundering, which is unknowable to his outward senses and, seemingly, to his conscious self. With nothing much happening in his life (and thus nothing to write about), Fritz arrives in the novel paranoid, afraid of the consequences of not completing his statement. He turns inward, immediately running into a most discomforting thought, his fear of death and—even more frightening—the prospect of living amid the constant certainty of death. “There is no use beating around the bush. I have to face an unpleasant fact. I will soon die,” Fritz writes very early on. “Death is standing next to me, always ready, and I’m afraid. My life is nothing but a fear of death and finding the ways of making this fear less unbearable. And one more thing: my life is a constant digression from the subject. My job is not to die but to write.” Here Basara is telling the reader, in black and white, how to read the book, and what immediately follows this passage is the first in a series of digressions that help form the structure of the novel, each digression also serving to heighten Fritz’s pathology as he scrambles to avoid the most unavoidable truth. For Fritz—as is typical for the self-observant observer (see: Bernhard)—laughter and despair are intractably linked. His digressions are typically very funny. (His first is a pathological discussion of the conspiracy of cancers, cirrhosis, tuberculosis, and billions of bacteria to stop the functioning of his organs.) They are often singular chunks of prose in which an idea or word is isolated and chewed at, murdered out of all meaning, Basara’s obsessive repetition pushed so far that the idea/word/image in question takes on new meaning that is completely divorced from its “real world” connotation, becoming at once funny and disturbing. This relentless repetition also brings us closer and closer to Fritz’s state of high anxiety as we experience him losing his language and thereby losing his mind. As the novel progresses, Fritz, who must return and return again to his desk to complete his statement, writes increasingly bizarre digressive texts in his effort to fill up the pages and finish his task: one night at a bar he meets—or, more likely, invents—a girl not named Luna (or at least in all likelihood her name is not Luna) whom he decides is his savior; then his neighbor (her name is probably Moira) cuts her veins open in an attempt to gain his attention and affection; his sister marries, then divorces, a man he calls “the mongoloid”; finally, his mother is kidnapped by white slave merchants, only to be returned safely home later that afternoon. These texts hold no common narrative links; they are merely stations on Fritz’s cyclical mental route and they look stranger and more disturbing every time we pass by. It is these serial digressions and Basara’s repetition of language that help the novel take on the form of the fugue: variations on the theme of Fritz’s obsession. The structure of the novel is the structure of Fritz’s pathology. Yes, Fritz’s writings (the novel) are clearly pathological but they also seem to shield him from a larger pathology. Forced to write this statement, his writings bring him into a tango with death from which he cannot extract himself. He cannot stop writing since it is the act of writing that is keeping him alive, his only guard against absolute apathy and monotony, which is to say, a state of living death. His mental wanderings (not what he says, but how he tells it) betray his humanity, reveal him as a thin fleshy strip marking the boundary, as he puts it, “between ‘I’ and ‘Nothingness.’ ” In this way, the account he produces—the novel we hold in our hands, in all its fractured madness—becomes a most earnest and, at times, touching statement for being. Fritz’s absurdist ramblings echo with perfect pitch those that have come before. It is a bold undertaking to write in such naked homage to the likes of Ionesco. Basara not only does this, but then draws attention to what he is doing. (Not only is Fritz a self-observant observer, the novel itself is conscious of its self-consciousness.) Back home from his psychiatrist’s office, trying to fill up pages and avoid death in all its forms, Fritz writes, “I lay down on the bed, without taking my coat off, and decided to read. I read backwards the whole of Don Quixote because this seemed a more human way of reading this book. First Don Quixote dies, and then Sancho Panza’s adventures follow, and then people in the book read the chapters that are coming… and only at the very end he is reading the dusty books that inspired him to perform heroic deeds for which he died a long time ago.” Directly following this passage, Fritz begins writing his own story in reverse (away, away from death! ), his attempt to subvert history, searching, like a nostalgic Quixote, for meaning and salvation in the past. There are moments in Basara of such stark and inexorable loneliness. By the end of Chinese Letter, we have a mad narrator similar to that in Krasznahorkai’s great novel War & War, a man who exclaims: “Believe me when I say, as I said before, he said, that the whole thing is unreadable, insane!! !” Such is Fritz’s statement (the novel): an unbeautiful, broken, intensely personal missive meant for nobody in particular. By the end, we can confirm what we may have suspected from the start: that the anonymous forces charging Fritz with his task have emerged, seemingly without reason or purpose, from within our narrator himself and that his “statement” is a madman’s transcendent vision of existence in an intolerably senseless world. Chinese Letter, which is Basara’s first novel, charges forever forward, headlong, packed with delightful language and playful prose. A heightened focus on the sentence imbues Basara’s prose with affirmations and negations of existence—his sentences writhe, breathe, which, makes rare moments of boilerplate (lifeless) existentialism all the more glaring. With Chinese Letter Basara has tapped into the most powerful fictional engine: a self-observing observer who is riddled by doubt. But unlike a Kafka or Bernhard narrator, Fritz is created not by his situation but by the author himself, which is to say that the self-consciousness of the novel is not always put to best use. Fritz’s task is self-imposed, not an inherent flaw of the novel, but it does at times limit Basara’s ability to transcend now-tired tropes of the existentialist novel. The Cyclist Conspiracy, on the other hand, is a defiantly unique and adventurous creation whose roots cannot be so easily traced. The novel is a collection of found texts—memoirs, manifestos, scholarly papers, historical archives, tales, poems, lists, maps, drawings—dedicated to the secret of the Evangelical Bicyclists of the Rose Cross, a mystical sect whose members gather in their dreams and spend their waking lives riding bicycles, smashing clocks, creating havoc, and meditating on the form of the velocipede. With one “S.B.” as the “editor” of this collection, the apocryphal texts span several centuries and detail the exploits of these mystics, who are deployed to various, often pivotal, moments in human history to exert their considerable influence over human affairs and subvert psychological, philosophical, political, and theological systems. Considered by many Serbian critics to be Basara’s best work—and one of the ten best Serbian novels to be written in the past quarter century—The Cyclist Conspiracy is definitely a more ambitious novel than his debut. The book is ostensibly an anthology tracing the Evangelical Bicyclists’ influence on human history, and the exploits of these anarchists bring a sense of play to the surface text, but the really interesting thing is Basara’s endlessly inventive use of a single, commonplace concept (the bicycle), which is the organizing principle behind the work. With nearly every text, Basara reimagines the bicycle (it is presented as a constellation, as the shape of a woman’s soul, as the Holy Spirit (if viewed from above); now it’s dissected and presented as an assemblage of ancient symbols) and with each successive text (each recurrence of the image) a mythology builds until, somewhere mid-novel, the Bicycle stands amid a slew of contradictory texts: an unknowable, baffling centerpiece that has had all its previous meaning torn away, an old invention made new, like the novel form itself in Basara’s hands. Not the relentless linguistic progression of Chinese Letter, The Cyclist Conspiracy is nonetheless highly structured and highly stylized. The organizing principle of Conspiracy is somewhat similar to that of Chinese Letter, but instead of a series of digressions that implicate a central concern, The Cyclist Conspiracy places the image at the heart, around which Barasa constructs a variety of texts, each a different form, always returning to the idea of the velocipede in bizarre ways and meanwhile having created space in which to show off his stylistic dexterity. The novel, in fact, is all artifice. As members of the Order traipse about history on their bikes making a mess of things (“We wanted to prove that a logical system can be built into any sort of nonsense,” boasts one member), so Basara proves it possible to subvert the “conventional” novel form in order to create a complex work that is beautiful in its meaningless madness. Included in the Order of the Evangelical Bicyclists of the Rose Cross are many famous figures, including Sigmund Freud (he also makes a cameo in Chinese Letter), Eugène Ionesco, Jozef Škvorecki, Bohumil Hrabal, George W. Bush, and Steven Hawking, among many others whose lives are all falsified to fit the needs of the novel—and most are further still altered as the novel evolves and progresses. Their histories are often not even consistent with their falsified versions posited by Basara earlier in the novel! Historical events are likewise exaggerated or totally fabricated. Anything with a “real world” equivalent is intentionally misrepresented in the novel; history is rewritten to serve a higher cause. “This chronicle should be accepted by the reader as a mystification,” reports one member, “because the reason for the existence of our Order is indeed the spreading of mystifications and the causing of disturbances.” Basara mocks our need to seek out cause-and-effect rationales that explain our collective narrative, our history—rationales that are logical, digestible, easily retained, and that are almost always false to one degree or another. (The act of creating and repeating such stories is another kind of system.) Basara has no interest in portraying history as it happened or positing any new version of events, but rather in subverting the method we use for telling and retelling it. There is a larger truth conveyed in his work: the novel ends with a series of documents that outline the Order’s master plan to build a Grand Insane Asylum that will house 20 million people (some of them characters in the novel). The absurd idea, meticulously spelled out for us by one of Basara’s madmen, step by step, is a hilarious capstone to the novel that perfectly captures the modern despair and madness that underlies such a plan and makes this one unsettlingly familiar, if not conceivable. Given our modern age of bad information, willful deceit and ignorance of those in power (and would-be power), there is solace in being reminded that this is not a new contagion. It seems it is a natural impulse of us to misinform, corrupt, and sicken our collective being. (We’re reminded of Basara “feeling averagely awful.”) When challenged, those who spread the sickness call their challengers blasphemous heretics, and they populate Basara’s fictive world as well. For Basara’s characters, even their names—convenient marks of identity—are fickle, deceitful, ultimately useless. What is great about Basara’s fiction is that, like any truly new advent, it arrives as if detached from any world outside its own, yet simultaneously it proves an organic outgrowth from the most hidden recesses of our reality. These are introductory notes to an author who is a major force in contemporary European literature. Thanks to a small number of English-language presses doing the heavy lifting, we will hopefully hear more from him in the near future. Taylor Davis-Van Atta is the founder and editor of Music & Literature, a brand new arts magazine dedicated to publishing critical literature on neglected composers and writers from around the world. The magazine debuts in print May 2012. Issue One features Hubert Selby, Jr., Micheline Aharonian Marcom, and the Estonian composer Arvo Pärt, and includes previously unpublished work by these featured artists as well as Stig Sæterbakken, Paul Vangelisti, Shushan Avagyan and many others.